In our intellectual property valuation practice, we are often asked by patentees how they can get a proverbial back-of-the-envelope assessment of the value of their patents. What at first blush sounds like a reasonable request, its proper answer is not as easy as most would like to think. In this series of blog posts, I will strive to address the question from a practical perspective. In the end, I believe we shall see that not only is there no simple answer, but the question might not be the right one to begin with. At the risk of repeating what must have been replied myriad times by patent attorneys and IP professionals, a patent is only the temporary right to exclude others from a specific market delimited by a written description of an innovation [USPTO Patents Portal]. It does not represent the right to practice an invention, or title to a royalty income stream; several factors are co-determinants of the economic value of the opportunity the patent represents. For example, if an inventor is issued a patent on an innovation which he/she cannot implement directly and no one else needs such invention to operate their business and satisfy actual consumer demands, then no actual market segment exists for the invention. 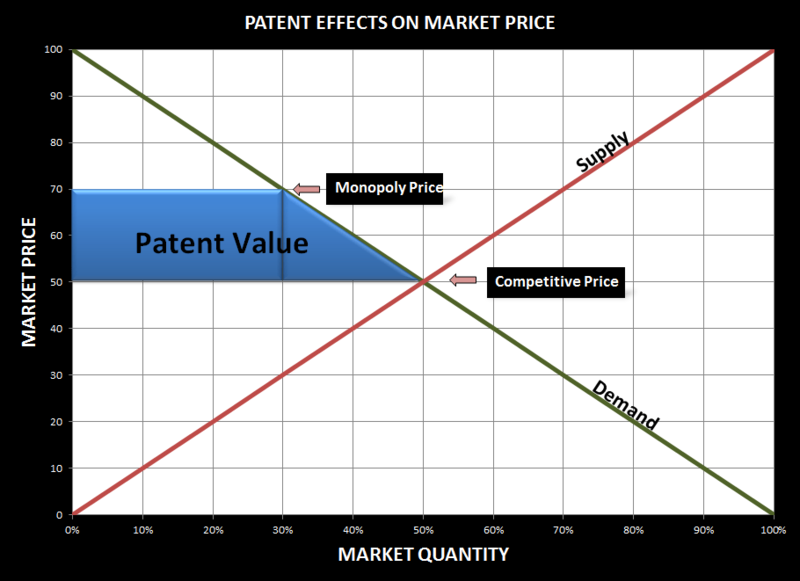 That patent is not simply worthless, rather it represents a net cost to the patent holder as obtaining a patent in the first place requires one to cover drafting, drawings, filing fees, and other prosecution costs which, realistically, are no less than $1,500 and could be as high as ten times that amount [Current USPTO fees]. By contrast, consider a situation where there is market demand for, e.g., an accessory that props up touchscreen cell phones because: (a) a large number of such cell phones are in use; (b) the phones must be held at an angle for confortable viewing of videos; (c) the cost of manufacturing the accessory is low relative to the phone at the appropriate volume levels. In this case, the value of this limited accessory business would be proportional to the net profits of the venture. Then, a patent that claims that invention would likely have economic value because the patent holder can exclude others from making, importing, using, and offering for sale, or selling that invention throughout the US and sell the product at a monopoly price. This price would be greater than the competitive price and, thus, the patent holder would effectively be reaping an economic rent: the incremental profit at the monopoly price over the net profit at the competitive price. Only this portion of incremental profit would be attributable to the patent and would therefore be the value of the patent. Thus, it is because the phone accessory business has value that a patent on the device would have economic value and, furthermore, the value of the patent is different from the value of the underlying business (and always smaller if the business is profitable in a competitive environment). Consequently, at this initial level of the inquiry, the right question would be closer to: What is the value of the underlying business, and how much can a patent contribute to that business value? We shall cover additional principles in the IPmetrics® Blog, and dig deeper into useful tools for estimating the elusive patent values.